Meanwhile, there’s some rough weather in the forecast for this weekend, and that, of course, means that birding could be interesting. Two separate cold fronts are actually scheduled to pass through: a weak one on Saturday that will have little, if any, impact on arriving migrants, and a stronger one on Sunday that will stretch into the Gulf and will likely have considerable impact. According to the latest model runs, the storms attending this front will be passing over Houston sometime Sunday morning, and over New Orleans by afternoon, so some degree of fallout in these areas seems likely. The bad news for those of us in the mid-South is that winds aloft over the Gulf will have little if any westerly component, so most of the action will probably be in Texas and southwestern Louisiana. I hope someone will prove me wrong. Looking a little further out, Monday is worth keeping an eye on. According to forecasts, conditions on Sunday evening will still be favorable for Yucatan departure; winds aloft over the northern Gulf will have a strong westerly component, nudging more migrants in our direction; and onshore winds may have shifted enough to the north to force birds to take a breather in coastal hotspots. I will try to post an updated forecast sometime later this weekend. On March 1, 1954, the entire flora and fauna of Bikini Atoll were vaporized in a 4-mile-wide, 99,000-degree fireball, as an American H-bomb test caused the biggest man-made explosion in history. (1) Shortly thereafter, the charred, denuded islands received a visitor: a yellowish dragonfly, about two inches long, drifting calmly in on the wind. 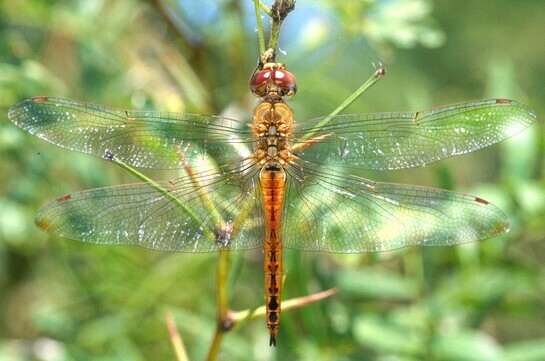 That the Wandering Glider (Pantala flavescens) is something more than your garden-variety dragonfly is suggested by its many nicknames – Globetrotter, Globe Skimmer, Storm Chaser, Typhoon Dragonfly – as well as its selection for the Worldwide Dragonfly Association’s official logo (see below). In fact, this extraordinary species is both the most abundant and the most cosmopolitan dragonfly in the world, found in both hemispheres to about 40 degrees latitude, and on such remote landmasses as Hawaii and Easter Island. It’s been recorded from ships in the middle of the ocean, and at 20,000 feet in the Himalaya. P. flavescens owes its ubiquity to its peripatetic lifestyle. One of a group of dragonflies known as rainpool gliders, it lays its eggs in temporary pools created by heavy rains, and is finely adapted – much like our last MOD, the Cedar Waxwing – for capitalizing on such an unpredictable resource. An aerodynamic teardrop-shaped body (with ample room for flight-fueling fat storage) and unusually broad wings help make it a champion flyer; in fact, it’s somewhat notorious among dragonfly collectors for being impossible to catch. (2) A highly accelerated life cycle allows it to get in and out of those ephemeral pools before they dry up: glider larvae feed with unparalleled aggression and appetite, and can go from egg to adult in a blistering six weeks. The emergence of adult gliders from a rainpool can be a real spectacle, with huge swarms forming (3), catching updrafts towards the stronger tailwinds aloft, and moving off en masse in search of new breeding sites – which could be on an entirely different continent. In southern India, rice paddies serve as prime glider breeding habitat, and swarm emergence is often timed to coincide with Onam, a rice-harvest festival that in many areas is the biggest event of the year. People in these parts know P. flavescens as onathumbikal, or the dragonfly of Onam. Migrating gliders are apparently unfazed by rain, and can be observed flying in rains heavy enough to drive just about every other insect undercover. Some evidence suggests that this species may actually hitch a ride with storm systems – even, perhaps, with hurricanes – in order to be perfectly poised to take advantage of fresh breeding habitat. In 1967, a team of Japanese entomologists recorded insect observations from a weather ship located far out at sea. When the ship took a direct hit from a typhoon, the intrepid observers climbed abovedecks in the eye of the storm, and to their amazement saw “an enormous number” of Wandering Gliders passing by. Although P. flavescens is often referred to as the most highly evolved dragonfly in the world (whatever that means), a few of its behaviors still need some work. Specifically, its ability to spot a rainpool is so acute that any smooth, shiny object can serve as a glider magnet; females can often be found absorbed in the quixotic task of laying eggs on the roof of a parked car. (1) Though soon to be outdone by the Soviets. (2) Gliders on Easter Island are less accomplished flyers; many of these adaptations have fallen into evolutionary disfavor in one of the most remote places on Earth, where long-distance flight means almost certain death. (3) One gilder swarm allegedly covered 13 square miles. The phantom ‘spokes’ of high reflectivity emanating from the station are caused by the radar beam being refracted downward, so what you’re actually seeing is the reflectivity of the ground. A common cause of this phenomenon is an atmospheric event known as a temperature inversion, which occurs when a layer of warmer air forms above a layer of cooler air, reversing the normal altitudinal trend and interfering with the radar beam’s path. This often happens on calm, clear nights within areas of high-pressure; after sunset, the ground begins to lose heat quickly, cooling the near-surface air, while subsiding air aloft (associated with the high) warms as it sinks, eventually forming a relatively stable blanket atop the cooler air below. These conditions prevailed over most of the Southeast last night, and soundings confirm that an inversion developed. Here is the temperature profile over Mobile at 1 AM. The red line follows the change in temperature with altitude; note the near-surface jag representing a warming trend (a pretty substantial one, of about 8 degrees F) from the ground up to about 1200 feet. What stands out to me is the tight clustering of targets near the radar station (mostly 20-30 miles away), reflecting birds traveling at unusually low altitudes (<1000 ft). With no cloud layers or headwinds aloft to keep them down, my best guess is that they were favoring the highly stable, slightly cooler air below the temperature inversion – or, more precisely, striking the best balance between staying low (to keep cool and avoid turbulence) and flying high (to catch stronger tailwinds). This is a hypothesis that could be evaluated by keeping close tabs on bird movements and temperature profiles . . .
On a side note, I was interested to see high reflectivities last night over parts of Georgia and Florida, despite easterly winds prevailing aloft. Here in the mid-South, this could be a good time to look for those elusive Florida migrants – birds like Cape May Warbler, Black-throated Blue Warbler, even (dare I speak its name?) Connecticut Warbler . . .